The other day the local news reported that the state of Maryland has dropped parallel parking from its driver’s test. 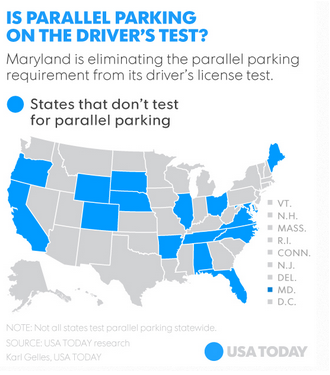 A Maryland spokesperson explained that the requirement is “redundant” with other tests. However, parallel parking separates the wheat from the chaff. Most people who fail the test do so because of the parallel parking burden. From now on, without such requirement, more people will pass the test. A triumph of better driving? I don’t think so! More licenses don’t mean that new drivers are more capable. The test is only an indicator for what is being tested. Dropping elements of a test may simplify a process but may not contribute to safer roads. If parallel parking is “redundant” and the skills are already included in other requirements, how come people fail the redundant part? If a student knows the answer to 1+2 but not to 3+5, can the math teacher pass that student? Imagine the consequence of allowing unqualified drivers on the road. This is much more serious than failed math students doing cashier work. The debate of continuing the National Security Agency’s telephone metadata collection program for terrorism surveillance is similar. It has been argued for years whether the program contributes to national security at a price of privacy concerns. Can the program’s insights really prevent terrorist attacks when terrorists and their supporters use a medley of communication tools. For example, whatsApp, SnapChat, RedPhone are new communication methods which don’t rely on phone lines but rather on internet connections. Can government interception stay ahead of the game? Not to mention that terrorists may ride motorcycles to pass along information without using any hi-tech tools. Should we monitor every motorcycle for national security? It is comforting to see that the House has passed a bill to end NSA’s collection of domestic phone metadata, while substituting case-by-case searches for national security concerns. Back to driving: The new test makes unqualified drivers’ lives easier, but it also takes away options from them as well. It is similar to the problem of drivers experienced only with automatic shifts rather than those experienced with a manual transmission. Drivers trained on automatic cars only may have great difficulty driving safely in Europe when they get a car with a manual transmission, which is typical for rentals. More skills can help us handle more kinds of situations, and therefore, make our life and that of others easier. Technologies such as backup cameras may help drivers prevent careless accidents. But expected advanced technology that can make driving easier, such as self-driving vehicles is, far from maturity. Nowadays, we tend to rush into the result of innovations to the detriment of established technology. When I first moved into our newly built building about five years ago, the building was beautiful with thin TVs on the walls, automatic doors and light control sensors. However, many electrical outlets did not work. In sum, the comfortable and easy way may be paved with good intentions, be it for learning how to drive or learning how to listen. Of course we should support innovations with good intent, but future ease may not yet work well with current reality. During the gap from now to fully adequate automation, we still need to learn how to drive and park safely, and how to intercept accurately.